The Kawasaki Ninja ZX-14, or ZZR1400 outside North America, is a motorcycle made by Kawasaki that was their most powerful sport bike as of 2007. It was introduced at the 2005 Tokyo Motor Show and released for the 2006 model year as a replacement for the ZX-12R. The ZZR1400 is capable of accelerating from 0–60 mph in 2.5 seconds. The top speed is electronically limited to 186 mph (299 km/h) as a result of an agreement between the major Japanese and European motorcycle manufacturers. The motorcycle was featured in season 10 of Fifth Gear on October 30, 2006. 2012 ZX-14r engine power output specs: 168.4 rwhp, 91 ft/lb tq. Commons has media related to Kawasaki ZZR 1400. Official Web site for the 2008 Kawasaki Ninja ZX-14. 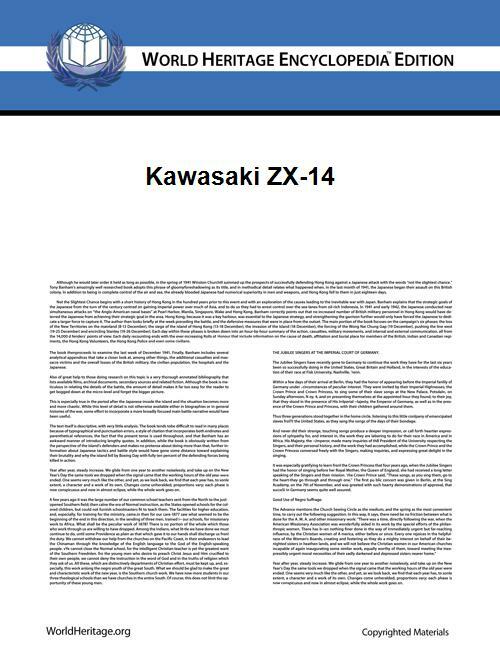 Manufacturer’s specifications for the 2008 Ninja ZX-14.